Chicago Soffit, Chicago Fascia, Master Remodeling & Construction, Inc. | Master Remodeling & Construction, Inc.
Chicago Soffit and Fascia are vital elements of a home’s overall appearance and structural integrity. Quality soffit can improve the appearance of your exterior, but its most important job is protecting your home in Chicago. That’s why every home has to breathe. 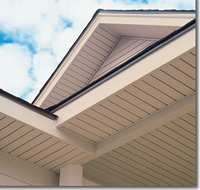 Fascia is the exterior edge of a roof’s overhang. It covers up the sub fascia or sub band around the edge of a roof. It prevents water and moisture from entering through the soffit. Chicago Soffit and Fascia combined form a watertight seal around the lower part of the roof and allows proper venting. Water damage can cause all kinds of problems for your home, but you can help prevent it if you buy the right type of fascia. While all types of Chicago fascia can function equally well, maintenance and cosmetic differences can help guide your decision.